I've tried to write and rewrite this post so many times, and I've finally come to the conclusion that the best approach is a simplistic approach. I have literally cut paragraphs and paragraphs of ideas and tangents from what you see now. (Maybe I'll use those for other articles.) And this was meant to go up for Christmas Eve, but I was too busy enjoying the holiday. And it may not be a post for everyone reading. In fact, for that reason I almost didn't post it all, but then I thought it might be helpful to someone out there. But today I want to talk about a subject that every once in a while, I see writers stress over. Which is, where do you draw "the line" in writing? Do you write that swear word? Do you not write that swear word? Do you have that character have an addiction? Not have an addiction? In the past, I have done multiple posts that speak to such things, on how and when or whether to use them, such as this post on profanity, and this other one about why we need stories about dark things. I'm tempted to dive deeper into this topic, but since I've had so much trouble writing this post, I promised I'd keep it simple. Look, it's impossible to write a good story with perfect people. And if you did, not only would it be boring, but there would be no growth. In fact, there would probably be no value. Because what is there to learn and gain? Like many writers, I have sometimes wondered where to draw "the line." In the writing world, it can quickly become clear that the answer is not always obvious. For one, the same content can be rendered in completely different ways, with different messages and tones, different levels of "graphic-ness." However, I want to share a realization I had a few of months ago that might be helpful (and again, it's simplified). 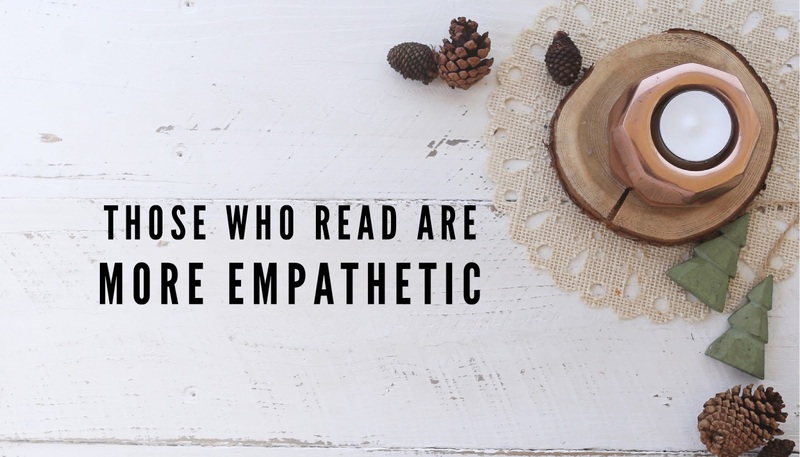 Years ago, I read a study that showed that those who read are more empathetic than others. Are there many other qualities that embody love better? I'd argue there are few. One of the most beautiful things about written stories is that they are the only medium where you can not only put yourself into someone else's body, but you can slip on and perceive their mind. It is the only medium where the audience can actually become someone else physically and cognitively--an experience that is completely impossible by all accounts in this life. But there is perhaps one person who has lived who had this ability (and this is where I might lose some of my readers reading this, but just give it a chance, even if you disagree). I personally believe it was real, but even if you believe it was fictitious, I hope you can still find it in your heart to appreciate the concept and story. Jesus spent much of His life serving and helping others. Not only were His deeds amazing, but His teachings were positively revolutionary. Love your enemies? What? Are you sure? However, the epitome of Christ's life was about His death. Where He took on all of humankind's sins and ailments, leading Him to bleed from "every pore." 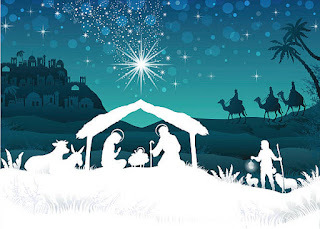 Now I can't speak for all other christian religions, but in the one I'm part of, we believe that not only was this done for our salvation, but another reason was so that Christ would know how to succor us perfectly. 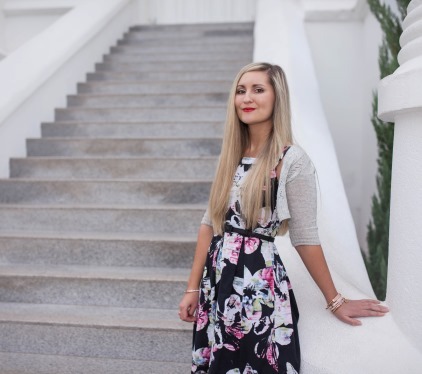 Through Christ's life, and especially through the atonement, He was a master of empathy. Even if you do not believe Him to be the Son of God, He was an amazing person. Even if you do not believe He was a real man, the story is an amazing story that teaches many wonderful principles to live by. 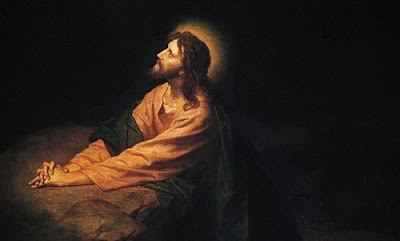 An important and vital aspect in the concept of Christ's atonement, is that He took on everyone's sins and hardships. He experienced everyone's. I do not believe that Christ got to one person and thought, "Wow, George is a drug addict, I better skip him," or "Tisha is a black who suffered prejudice, I think I'd rather not," or "Jennifer suffered trials as a closet lesbian, I don't want to experience what that was like, skip." He did not sift through the content. So not only is developing empathy a wonderful thing, I'd argue it's positively god-like. Now that's not to say you should not have any personal limits or lines. After all, I'm not Jesus, and I have my own limitations. Nor am I prophesied of saving all mankind by taking on all their sins and ailments (shocking, I know). But we do a disservice to ourselves and the world by not reading or writing certain realms of the human experience. And ignorance is a danger. One of the greatest commandments is to love. And it's much easier to do that when you can vicariously experience what others experience. Some of my favorite stories have hugely flawed characters--and I loved them. And I learned so much from them. Not only that, but I believe one of the reasons we are here is to gain human experience. After all, I could easily hang out in Heaven and read the scriptures all day without having to deal with the troubles of this fallen world. We don't need to be on earth to read the word of God. So next time you are stressing out about "Should I?" or "Shouldn't I?" I just want you to remember this. That someone who people consider a God willingly had that mortal experience. Then if you want, you can go look at all the technicalities and treatments and use your own judgement to make a decision. 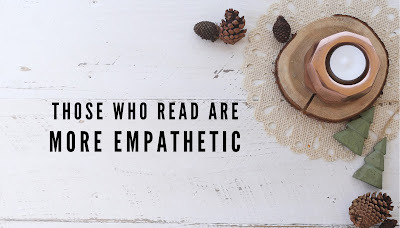 But I would argue that to be empathetic is to be godly. But another element of story that should be in your scene just as it is in the overall novel is how your character changes, or in other words, the character arc. In a single scene, the character arc may or may not relate to the overall character arc. But there (usually) needs to be an arc of some kind. Psychologically, the character needs to be in some kind of motion. For a scene, think of it as a mini character arc. How your character starts the scene psychologically and then how he or she ends the scene, psychologically. They should be different. Let's go back to my examples from last time. I had a scene where a character falls in love. Another where two characters discover who the murderer is via discussion. And finally, I referred to a real scene in a story--Newt going into his suitcase for the first time on screen. In each of these, you could say the mini character arc is quite simple, since each character ends in a new state or has new information (which relates to the purpose or goal of the scene). However, not being something is sometimes not enough. It's often not very tangible. As you work with scenes, often the state the character starts the scene comes from a previous scene, after all, in a story, we are dealing over and over again with cause and effect. So in a previous scene, Newt realizes some of his magical beasts got out, therefore, he needs more knowledge in order to catch them--which beasts got out? Between him realizing that, to him actually going in his case to count them, there are a several other scenes, which also contribute to the state he starts in. For one, he has to figure out how to heal Jacob, and that's quite important (especially for the rest of the scene). What is being brought to the scene? How can I take advantage of that? This can relate to the mini arc. 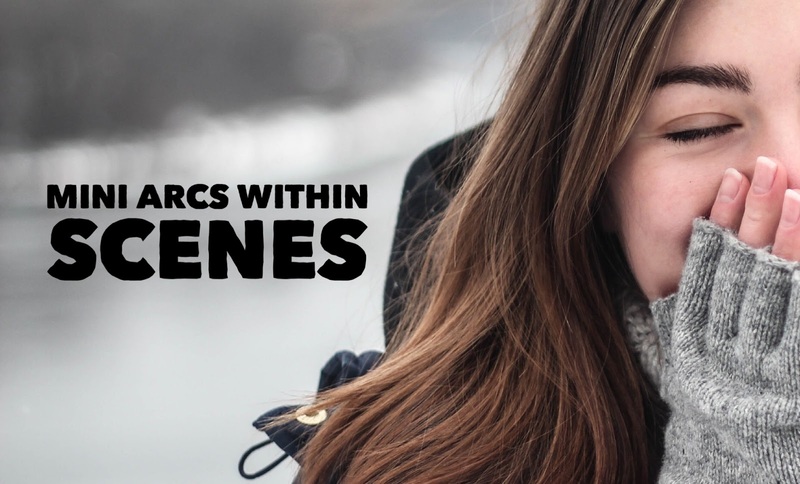 What emotions, attitudes, worldviews, and behaviors is the character bringing to the scene? How will the purpose, goals, and conflicts of the scene affect that? How will they change by the end of the scene? In my love and murder examples, I'd probably sit down and think about my character and what they bring to the scene. Maybe my heroine thinks the guy she's about to fall for is a showoff. Perhaps he has a reputation she doesn't like. And if I'm going off what I said last time, to make matters worse, it's forbidden to love him. In my murder example, the protagonist might start the scene already thinking he knows who the murderer is. Or maybe he's at least convinced he's narrowed it down to three people. Maybe his own biases and arrogance have clouded his thinking. As the scene's plot (or mini plot) progresses, the heroine falls in love. The hero realizes during the course of the discussion that he was wrong. Whatever it is, they end the scene in a different state. Again, this may or may not relate to the overall character arc. Let's say that the overall arc in our murder novel deals with the protagonist realizing and overcoming his own biases and arrogance. Then the example I just gave deals directly with that. Let's say that the love example happens in a story where love isn't actually the main conflict or focus. Instead, the story is mainly about a young girl following her dreams to be an actress, and her overall character arc is about moving from being insecure and looking to everyone else for validation to being secure and finding validation within. Whatever the case, the mini arc relates to the main character of that scene. But there are also characters that may arc. For example, in the scene of Newt taking Jacob into his suitcase, Jacob has his own mini arc. How he starts the scene is different from how he ends it. He moves from ignorance to knowledge. In some scenes, all the characters may arc. In others, only the "main character" of the scene may arc. In rare cases, maybe not even that. In a few specific scenes, the point is to show that a character doesn't change. In my murder example, perhaps the character is still convinced, even after the discussion, that he is right--he is still so blinded by his own biases and arrogance (even if the audience may not be). Some characters, particularly those with extreme characteristics, may refuse to change. For example, in the musical Hamilton, Alexander Hamilton is a hard worker to a fault--he's a workaholic. 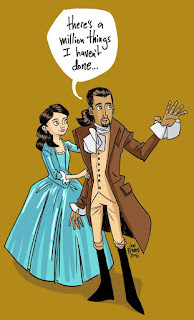 In the number (aptly named) "Non-Stop," Burr, Eliza, George Washington, and even nameless characters, speak to or touch on the idea of him needing to slow down--but he never does. The point of the song is to illustrate how he never slows down. And ultimately the only way to get him to change is to have him wreck havoc upon himself. However, it should be noted that even though Hamilton doesn't change internally in that song, he still changes as a character externally, climbing career ladder after career ladder. So even if your character doesn't change internally in a scene, they almost always need to change externally at least. As I said at the beginning of this article, they almost always need to be in some kind of motion. To what extent and in what way, may be dictated by the point of the scene, or if not, it may be something you need to come up with if only for within that scene. As with all the other points of a scene I've made so far, remember that you are working on a small scale. It's completely possible for a mini character arc to take up only a few sentences in some scenes. In the future I'll be talking more about how the character's state and the mini plot of a scene work together, defining more points of each. 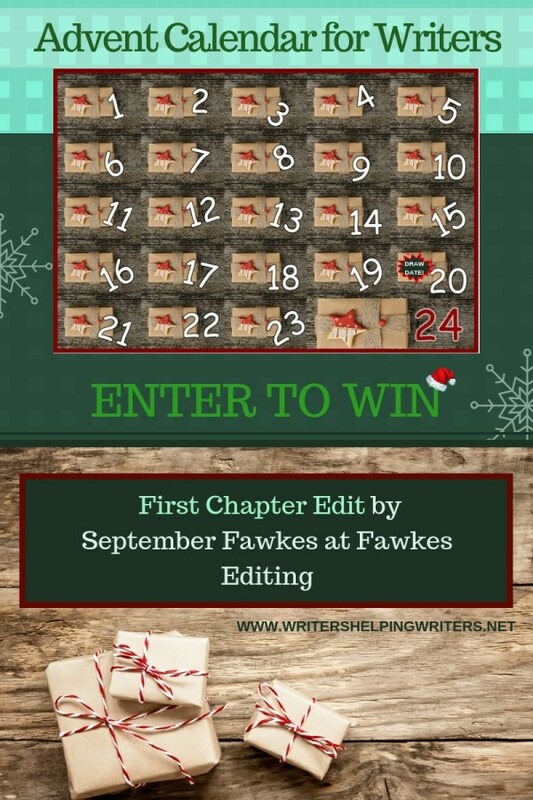 Also, don't forget that you have until the 19th (Wednesday) to enter our advent calendar for writers! All of the gifts have been revealed, and you can still enter for the chance to win each one, including mine. Last week I was going through some old scenes and reading through them rather quickly but still tweaking them here and there to be more effective. While some I thought were good, they didn't have the same zing to them, and I realized it was because they didn't fully follow a satisfying structure. You can find a lot of articles about structuring scenes, and I won't have room to cover everything here (though maybe over time I can get them all on my site), but I wanted to start with same basics that can be helpful to everyone. When we talk about overall story structure and strip everything away to the bare, bare bones, it should follow Freytag's Pyramid. This was posted online a while ago, and I saw someone commenting and laughing how it was out of date and that for the modern audience, Freytag's Pyramid isn't going to work. This is like saying that because we now have hip-hop, dance doesn't work. But hip-hop is dance. 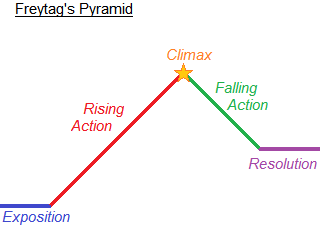 All satisfying story structures embody Freytag's Pyramid even if they add more elements. 7-Point Plot Structure, the Hero's Journey, whatever. All of them follow Freytag's Pyramid because it's the most basic unit of story structure. Just as hip-hop adds more specificity, but is still dance. And when you start working with scenes, you'll notice that most successful scenes also follow this structure, on a small scale. Like everything, there are exceptions. But as you actually genuinely work at writing a satisfying novel, you may realize that we use this simple structure everywhere--plotting, character arcs, dialogue exchanges, sometimes even within a paragraph. Never underestimate the power of the basics. As Leonardo da Vinci once stated, "Simplicity is the ultimate sophistication." 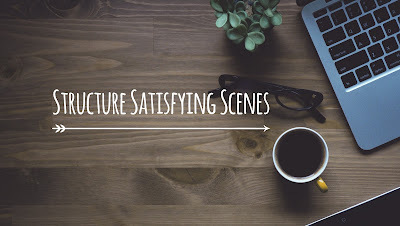 With that in mind, let's talk about how satisfying scene structure actually mimics overall story structure, which may include elements that are often added to Freytag's Pyramid. Before worrying about scene structure, it's helpful to identify a few key elements of the scene. Purpose - What is the purpose of the scene? It should be moving the story forward in some way. This might be obvious, like having the protagonist confront the antagonist, but other times it might be a little less obvious, like introducing the audience to a rule in a magic system, revealing a character trait, or stating a theme. But the point is that the scene has a purpose and it's not superfluous. Ask yourself, what is the audience getting out of this scene? Goal - The main character (of the scene) should have a goal of some kind, something he or she wants. As a beginning writer, it can be easy to want to skimp out on this, but it's very effective in writing a good scene and practically a necessity. It may be something immediately obvious and direct, like defeating the antagonist. Other times it might be more personal or even indirect, like Bilbo Baggins wanting to be left alone in his Hobbit hole--that may not be the main purpose of the scene, but it's there. This is why "purpose" and "goal" are two different categories. Conflict - What kind of conflicts or potential conflicts (a.k.a. tension) will be present in this scene? Is it the physical wrestle between the protagonist and antagonist? Is it Vernon Dursley being bombarded time and time again with peculiar happenings and people? And him being afraid to call his wife and ask about the Potters? Is it Bilbo having to deal with people wanting to socialize? Sometimes, all these things line up in scenes, especially toward the end of the novel. Goal: Protagonist wants to defeat antagonist in a sword fight. But in other scenes, it might be more indirect or sometimes not seem to match at all. Here is one from a scene in the first Fantastic Beasts movie. 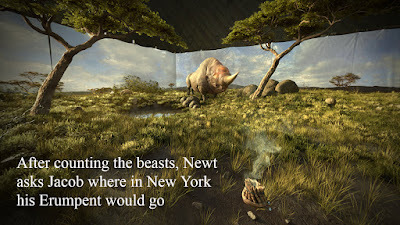 Purpose: Introduce the audience to Newt's magical case and all the beasts/elements inside, while appealing to wonder. 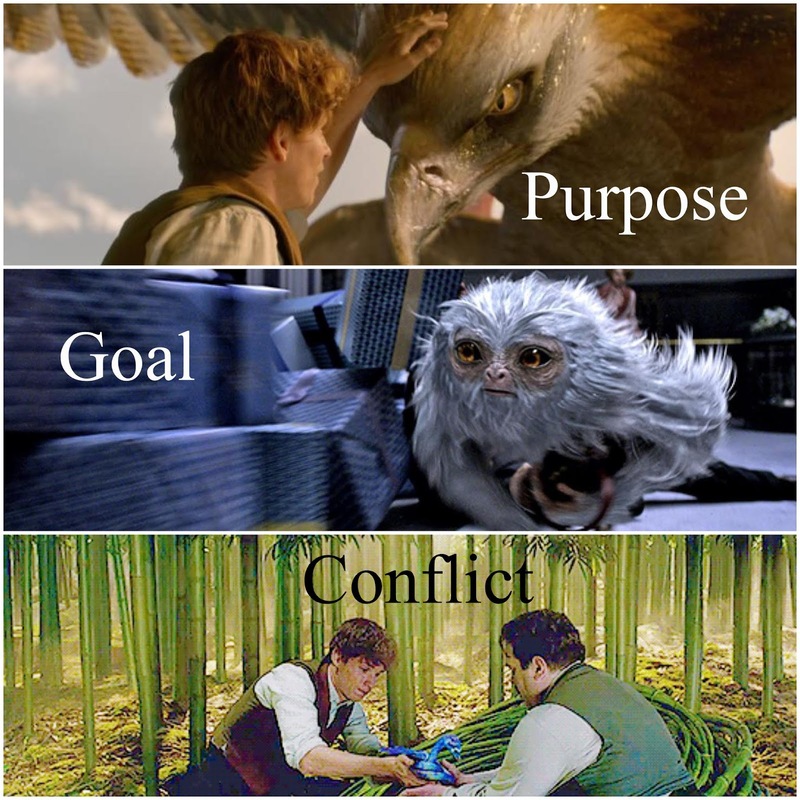 Conflicts: I'm going to argue that the main conflicts center on Jacob being a Muggle--first Newt has to figure out how to heal him when Muggle biology is a little different, then Jacob doesn't know how to interact with the creatures, and finally, he almost messes with the Obscurus and Newt has to stop him. Ideally, most scenes have more than one purpose, more than one goal, and more than one conflict. In fact, it's practically a necessity. So in my last example, another purpose of the scene is to foreshadow and introduce the Obscurus. Newt also reveals his goal to release the Thunderbird. And he doesn't want Jacob to be obliviated. He touches on other conflicts--Frank being trafficked, the Niffler always getting out, the last breeding pair of Graphorns. There are mini-goals that I already mentioned, healing Jacob and feeding the animals. And mini-conflicts, an Occamy tries to bite Jacob, and Pickett won't get off Newt's hand. You'll notice that even if the main purpose, goal, and conflict don't line up directly, they will naturally overlap during the scene itself in some way because they are elements that have to be present and therefore have to be interwoven to be satisfying. 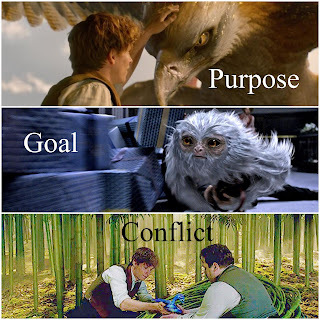 In order to fulfill the purpose of the last example, Newt has to go in his case, which means he needs to have a need/goal for doing that, and to show off the animals in interesting ways, there needs to be conflict for balance. So they overlap, but they aren't directly the same thing, unlike, say the final sword fight between hero and villain. And this is where I think some beginning writers have a problem--they don't have to all be the same thing. And in many stories, in the beginning scenes, they won't be. Remember Freytag's Pyramid? Great. 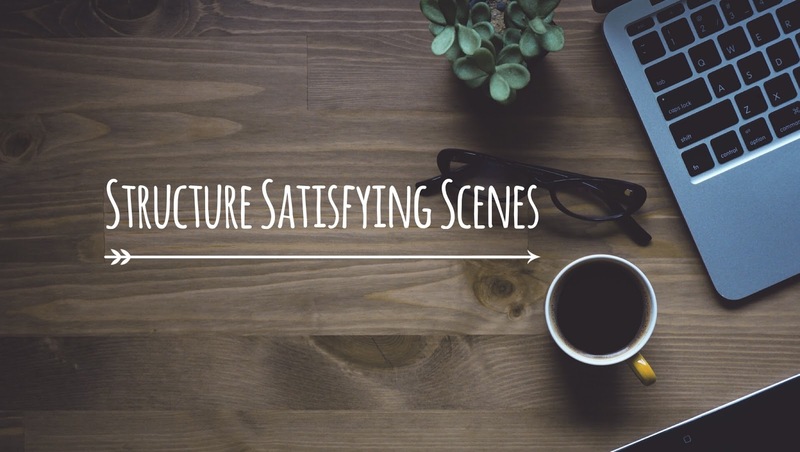 Most satisfying scenes follow that same structure, but on a smaller scale. I don't care if your scene is about a character falling in love with another, a conversation about what the antagonist is up to, or a train ride to school. If it's going to be effective, it most likely needs the setup, rising action, and climax. I should have mentioned above that some say the denouement (falling action) is optional--I strongly argue that in stories, they should almost always be included for validation, but in scenes, I think that can vary a little more, somewhat. I'm going to add one more element. The hook. And instead of "exposition," I'm going to call it "setup." So here are the basic parts of a satisfying scene. Hook - Grab the audience's attention in some way. This doesn't need to be clickbait, people. Hooks work on promises--they give the audience something to anticipate. Often this is something to hope for or to dread. But sometimes it's just the promise of more information--the hook communicates to the audience that they need(want) more information. 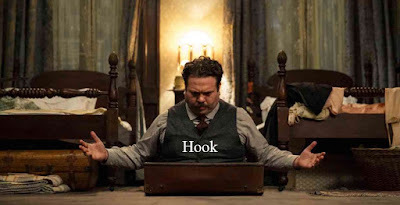 In my Fantastic Beasts example, I'm going to argue the hook is Newt and then Jacob disappearing magically into the suitcase. Since we know he keeps creatures in that case, we anticipate seeing them. Setup - Author David Farland calls this part "grounding." We need to ground the audience. Where are we? When are we? And who is present? Give us an idea. How much you need of this may depend on the prior scene(s). In the very first scene of a book, we usually need more grounding (and setup in the large-scale sense, which is one reason why openings are so hard). The camera shows Newt in the case in the first room with Jacob. Great, they both turned up in the same place. Then later we follow them out and get a glimpse of this case having animal habitats. Rising Action - Once readers are invested and know where we are, it's time to build rising action. What it is depends on the preliminary elements: the purpose, goal, and conflicts. If the main purpose is for one character to fall for another, we might cook up sexual tension. If the purpose is to figure out who the murderer is via a conversation between two heroes, the heroes may start talking about conflicts and clues, stakes and goals, and suspects. 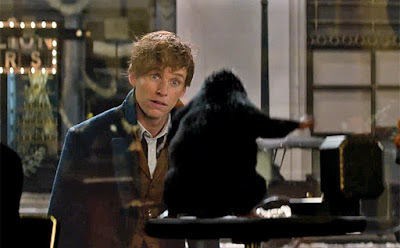 In Newt's suitcase, the rising action is checking the animals--which appeals to the purpose and goal and incorporates conflict. Like the middle of a story, the rising action of the scene escalates. This is why it's called rising action. This is what happens in our Newt example. Newt doesn't have too much trouble curing Jacob, then he goes to the Thunderbird, where he has to he warn Jacob that Frank doesn't like strangers. When he tries to let go of Pickett, it's more difficult than the other two things. He shows Jacob the Occamies, but one nearly bites off Jacob's finger. Eventually this escalates to Newt having to stop the most dangerous outcome of all, Jacob messing with the Obscurus. Alternative to conflicts and tension, you can see the purpose of the scene itself escalate. 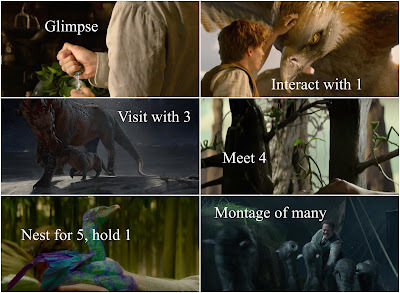 First we briefly glimpse the Swooping Evil, then interact with Frank, then visit three Graphorns, then four bowtruckles, four Occamies (would be five, but one is missing, but Jacob and Newt both hold one), then a montage of a whole bunch of different animals with Newt and Jacob interacting with them. Climax - This is the high point, where the purpose, conflict, and/or goal reach their max for the scene. This is the moment the character falls in love in our prior example. This is the line in the conversation where the heroes realize which of the suspects is the murderer. For Newt, I actually included the climaxes in the last example to illustrate. For the conflict, the climax is when Jacob is near the Obscurus. For the purpose, the climax is when we get that montage of loads of fantastic beasts. What about the goal? It's when Newt finishes counting the beasts at the Erumpent pen. You'll notice that this climax is much more subtle. That's okay. 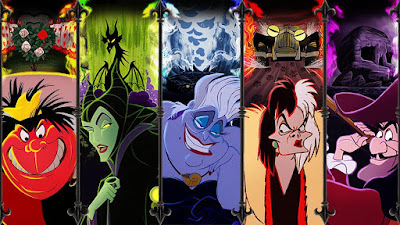 In some scenes the character's goal may not even climax, because it changes or remains unfulfilled or gets obstructed. You don't need everything to climax, but there should usually be some form of climax. Denouement (Falling Action) - On occasions, some scenes will not have a denouement. But I think we sometimes misunderstand falling actions. They don't necessarily tie everything up if there is more to the story. This is the same thing with series books. The denouement may tie up the main elements of the novel, but it also keeps us looking forward to what happens next, in other words, it has a promise, a.k.a. hook, that gets us to anticipate, usually through hope or dread, what might come next. In my hook section, I said the hook for Newt was him going into his case. Some of you might have realized that was actually the end (denouement) of the prior scene. It doesn't have to be structured like that. You can have hooks at both the end of one scene and the beginning of another--in fact, you usually should. But my point is that there should usually be some kind of hook to get us to want to keep reading. Often naturally, in a scene, the denouement will get us to look ahead. Great, our heroine fell in love--but guess what? We know from the setup that this is a forbidden love, so now what's she gonna do? Our heroes figured out who the murderer is, great, so now how are they going to catch him? Newt knows which creatures are missing, so now how is he going to recover those? In the overall story, the denouement may validate what happened to the reader. This may or may not happen in a scene. In our love example, we may have a few lines that validate that yes, our heroine did just fall for that guy. Or yes, that suspect has to be the murderer, because look at how this now all fits (and the heroes will be talking about that). The falling action finishes the scene. In some cases, it may be cut to end on a cliffhanger. Just don't forget that just because you have a denouement doesn't mean you can't have the audience anticipating what happens next. Some beginning writers think you can only achieve that by axing the falling action. If you do that every time, it can get annoying, and make the story feel "gap"-ish as you never "finish" one scene before starting another. Note - Scenes are much briefer than an overall story. Depending on the scene, these may take paragraphs or they may be as short as half a sentence. For example, you may have the hook and the setup in the same sentence. But whatever the case, they typically follow the same proportions. The rising action takes up the bulk of the scene, while the hook will be the shortest. There are really so many ways to talk about how a scene works and other approaches, but this is a good one to start on. If any of this is paralyzing to you, relax. If you are an outliner, you can use this to help you outline scenes. If you are a discovery writer, go ahead and discover the scene, then if you are stuck or feel like it's lacking, go through these like checkpoints. This is meant to work for you, not for you to work for it. I want to go on, but this post is getting rather long, so next week I'll be back to talk about how the character moves psychologically through the scene. 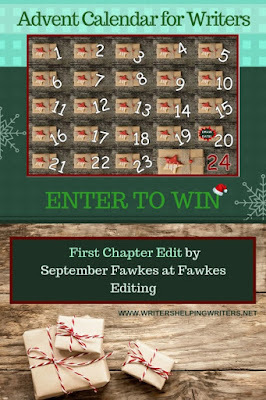 Giveaway - I'm giving away a first chapter edit for our advent calendar for writers! The great thing is, if you are already subscribed to my blog or follow me on social media, all you need to do is click a couple of times to enter. You can enter here. 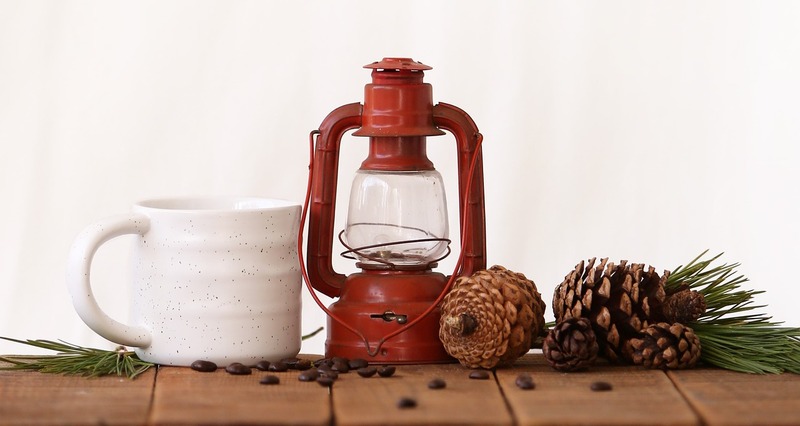 Check out all the other gifts so far here. You can still enter to win them, too! As probably a lot of you know, I'm a big outliner. I've talked about this before. I'm not a 100% outliner--I definitely like to leave room for discovery writing, but if I try to discovery write more than half, maybe more than a quarter, I end up writing crap (sadly). And I think it ends up taking more work to fix. If you are just joining us and have no idea what I'm talking about, let me explain real quick. Most writers are a hybrid of both, but may lean one direction. I wanted to wrap my hands around Dear Author’s neck and give him a giant, head-whacking shake. Being a Plotter vs being a Discovery Writer (which term I will use going forward), has nothing to do with skills, ability, or messes. 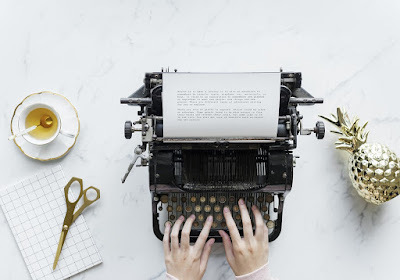 It has everything to do with how a writer connects with creativity. I connect by fighting things out on the page. That’s where my best ideas come from. Trust me. I’ve tried to plot. I once forced myself to write an entire book based off an outline, and you know what? It was the most boring thing I’ve ever written, and no amount of rewriting or editing saved it from being shoved under the dusty back corner of my bed. Best case scenario when I try to plot is that I get a couple of chapters in and my contemporary teenage protag suddenly swishes her skirts, dabs a poison on her lips, and says fiddle-dee-dee to her best friend from the Andromeda Galaxy and my carefully devised plot-sheet also ends up under the bed. I have no choice but to fight things out on the page. And it’s not just me. This is what we Discovery Writers do. Which means we have a whole set of both tripwires and pitfalls that can be (but not always are) unique to us. This is me staring at an entirely white screen, a frown on my face, a headache forming as I once again wish that I was a Plotter who always knew what needs to be written next. It happens. It happens a lot. The goal then is to have a plan for when it happens. Now you don’t have to follow my plan for being stuck, but feel free to try if it helps. If you happen to be a Discovery Writer who already knows how to spark your creativity, let us know in the comments as there isn’t one right way to beat the blank page. The important thing is to have a plan ready when the blank page syndrome strikes. The second tripwire works the same way. I’ve conquered my blank pages (and fired my housekeeper in the process). I’m at the 75% mark of the book. The protag is facing a Mt. Everest of a challenge (in skirts, with her alien best friend at her side). The love interest is being skewered (emotionally if not physically). All hope is lost. There’s no way out. They are all going to die (but in pretty clothes). Being cornered is also something Discovery Writers just have to plan for. It happens to me every book, sometimes repeatedly, generally at the turning points and the climax of the story. What I do is take my trusty notebook and write out exactly what the corner looks like. Where is the story stuck and unfixable? Why can’t my protag resolve the situation (or just plain old get out of it)? Then below this, I number 1-100. Or (when I’m feeling nonlinear) I write the problem dead center of the page and turn the whole thing into a brain map of bubbles and clouds. I walk away from the computer (more laundry) and force myself to come up with 100 possible solutions regardless of how ridiculous or unrealistic they are. And they get crazy. And stupid. And so, so embarrassing that I’m not even going to give you any examples. The goal is to get all the crazy answers out. Then once they are gone, my brain has no choice but to come up with something better. The physical action of writing it all down via pen and paper is super important too. I see myself as freeing up the same part of my brain that insists I have to be a Discovery Writer in the first place. And it totally works. Good ideas do show up, usually after I’ve listed out 80 bad ones. But that leads us to the one giant Pitfall that I’ve seen Discovery Writers fall into and sometimes never recover from. There are writers who never take a writing class, never attend a conference, never use a beta reader, who still go on to publish. It happens (I HATE that it happens. SO unfair), but the majority of us won’t ever do that. Yes, story structure is so ingrained in our culture and our mindsets that whether we understand it or not we will use it. But that’s not good enough. Story structure (whether you look at it from the perspective of Scene/Sequel, Hero’s Journey, Three-Act-Play (or better yet all three hand-in-hand)) needs to be the best-friend of Plotters and Discovery Writers alike. 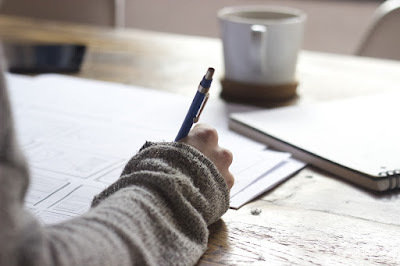 Plotters do have an advantage in pre-planning their books around proper structure that Discovery Writer don’t, but there are things Discovery Writers can do to overcome this. The first, of course, is making sure we understand structure in the first place. 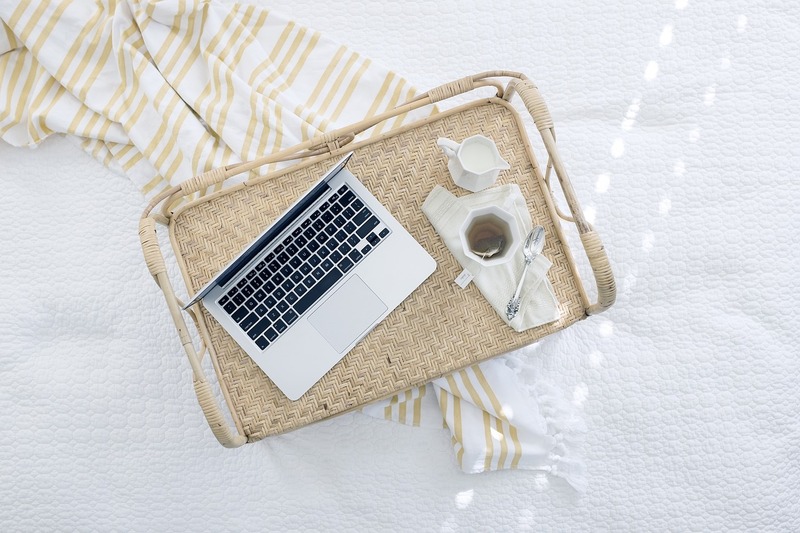 If you don’t, drop everything and go learn it (I mean after you finish reading this article…) I recommend starting with books and classes written for screenwriters. They do a much better job of explaining story structure than craft books for novelists. Then after the fun/torture of the first draft is done, Discovery Writers can back up and make sure all structure elements are in the right places, happening to the right people. We can edit our way to good structure. Sounds simple. And maybe even a bit obvious. But I can’t tell you how many discussions I’ve had with writers who don’t bother to do this and take a "I’m a Discovery Writer, I trust it will all just work out" attitude. Again, for a lucky few, it probably does. For most of us, we need every advantage we can get. 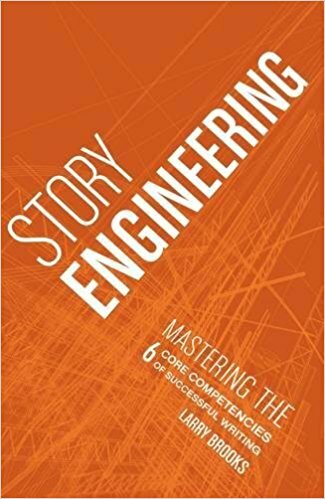 Proper story structure makes storytelling more effective and creates a more intuitive connection for readers. So, there it is. Two tripwires that I fall over regularly and a pitfall I avoid. I wouldn’t be surprised though if other Discovery Writers have additional stumbling blocks in their way. If you do, please give them a share in the comments and explain how you beat them. Because while our stories do just spill out of us, that doesn’t make them a mess and it certainly doesn’t make them irredeemable. It just means our processes, our connection to creativity, and our related challenges are a little bit different. 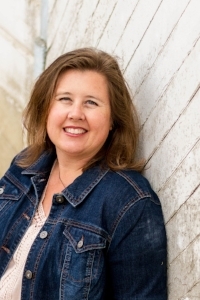 Rachel Taylor is a YA Fantasy author repped by Rachel Brooks of BookEnds Lit. She can be found at www.racheltaylorwrites.com. This time of year, there’s always a lot going on and stress can creep in as we rush to prepare for the upcoming holiday. 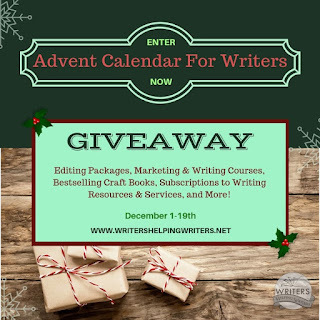 So, to help focus on the good things and celebrate this terrific writing community we’re all part of, I’ve teamed up with Becca & Angela at Writers Helping Writers to bring you an Advent Calendar for Writers. Not only will I be giving away a prize, but some of my favorite writing tip authors are too! 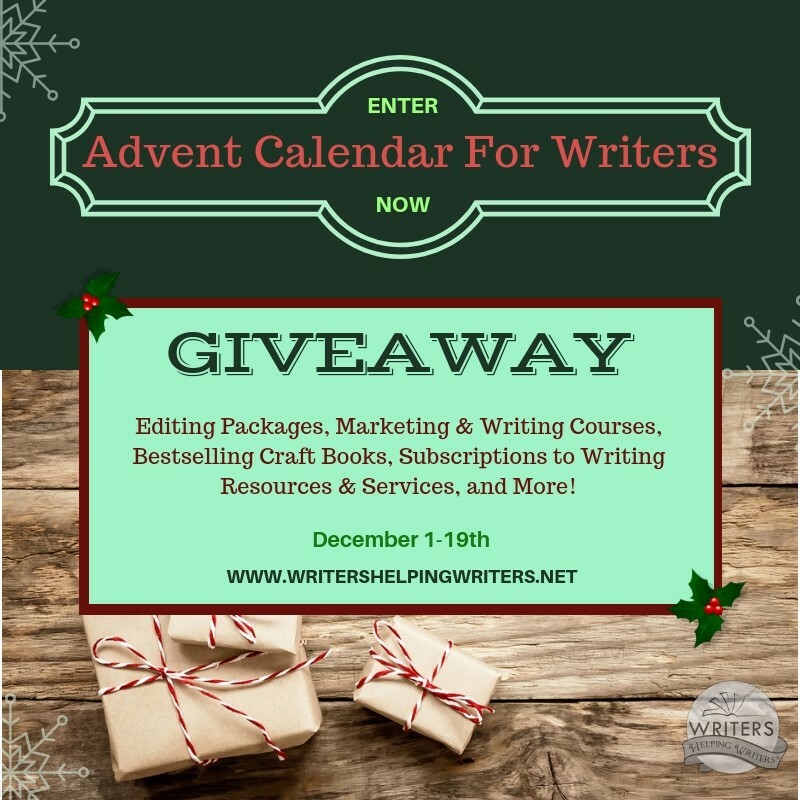 Our calendar works just like those delightful chocolate-filled kinds, only instead of a nibble of sweetness you get a chance to win some AMAZING prizes that can help you on your writing journey. These prizes are exceptional, and while I can’t spill the beans on upcoming draws (why ruin the fun?) I can tell you that in total they are valued at over $2000! So when you’re online this month, drop by this post because Angela & Becca will be updating it every day between December 1st to the 14th with a link to a new giveaway in the Advent Calendar. If you miss a day or two, don’t worry—all draws will remain open until the 19th of December. Who knows, maybe you’ll win yourself something special for this holiday season! Over the last few weeks I have actually started brainstorming and even outlining my next novel. I still have a lot to figure out but recently, I was reminded again how effective it can be to consider your antagonist's plotline early in the process. Most of us have a rough idea of what our antagonist is or does by the time we really sit down to brainstorm. At minimum, we at least have a notion. After all, we need an antagonistic force to have conflict for a story. But it's very easy and very tempting to put all our focus on the protagonist. It's absolutely necessary to spend plenty of time discovering and nailing down our protagonist, but it can be extremely effective to really consider your antagonist quite early in the process. This is because (obviously) the antagonist will be what your protagonist is up against. Often we might focus only on the protagonist's view of the plot, thinking about what sorts of obstacles, conflicts, and resistance they will meet and need to overcome and what will be interesting. However, the antagonist has a very different view of what's going on, even if it doesn't all make it on the page. He or she or it will be "fighting" against the protagonist. The protagonist reacts and battles the antagonist, but so does the antagonist react to and battle the protagonist. If your antagonist is a person or society (as opposed to nature or self) you should consider how their plot would play out. What would they do next? How would they respond to the protagonist's efforts? What is the cleverest way they would handle this situation? When you take the time to consider the antagonist's story early, you will be able to brainstorm and map out a more powerful story for your protagonist. Beyond the protagonist and main antagonist, it's also helpful to take some time to consider what the situation looks like through other characters' perspectives (as long as you don't get too carried away). How does the love interest view what is playing out between the antagonist and protagonist? What about a close family member or friend? Like the main antagonist, it can also be very effective to look at the plot, conflict, or issues from any other antagonistic forces. For example, in the project I'm working on, the protagonist has to team up with a gray character who is an antagonist-sympathizer. Though he's not the main villain, I have found that I can brainstorm a better story when I take time to think about his view, actions, and reactions, early in the creative process. What this does is give my protagonist more powerful or significant conflicts. I have better quality ideas, and my protagonist needs to deal with them in clever ways. In other words, it produces a better story quicker. I have better ideas in brainstorming. This sort of approach is also a great way to help you create strong side characters, because it ensures you are creating a plot where the side characters don't only exist for the sake of the protagonist. When we are learning to plot for the very first time, we are often asked to consider what try/fail cycles and obstacles are keeping the protagonist from reaching his goals, and then trying to brainstorm what those are and how he overcomes them. 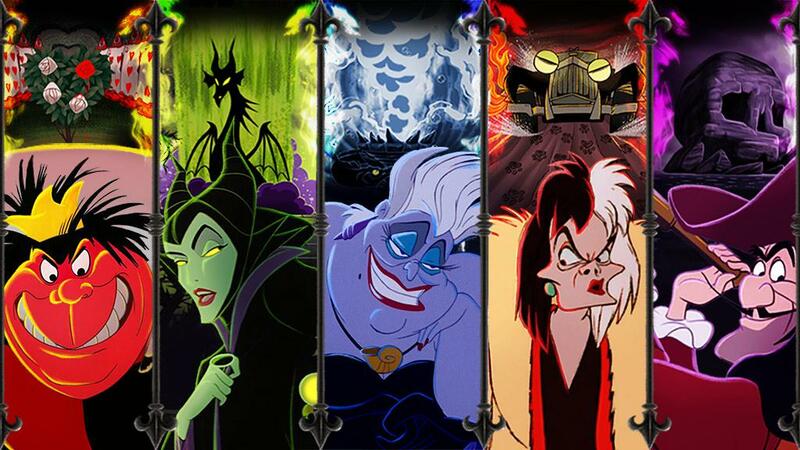 Then we might go back and see how the antagonist can make those obstacles happen, or what kind of antagonist we need. Then, we might start fleshing out and filling in the side characters to populate the story. When it comes down to it, I don't really believe there is a "wrong" approach to coming up with your story--you have to find what works for you. But when you are next brainstorming, try taking time to consider your antagonist and supporting cast earlier and see if that helps you actually develop a better plotline for your protagonist. We talk about the antagonist as a character a lot, but perhaps not enough about his or her or its own actions and reactions when brainstorming. And that's the tip for the week.